Kate wants to buy a new TV. She has a new house and she needs a new TV. She doesn’t know much about modern TVs. Her old TV was really, really old. She liked that TV but nobody sells that kind of TV. She opens her computer. She learns she can buy many different TVs. Modern TVs are like computers. There are so many different kinds of TVs. She doesn’t know what to buy. She asks friends to help. Everybody has different ideas. She meets a good friend Anthony. She wants to know what he thinks about TVs. Anthony doesn’t like TVs. He tells her that it is not very clever to buy a TV. He thinks that TV news is stupid. He tells her that she can watch many good films on her computer. If she wants a bigger monitor, she can just buy one. It is much cheaper than a TV. She can watch what she wants and when she wants it. Kate thanks Anthony for the idea. She doesn’t buy a TV. She buys a little bigger monitor. If somebody asks her why she doesn’t have a TV, she will answer she doesn’t need one. 1. What does Kate want to buy? 3. Anthony thinks it is _______ to buy a TV. 4. Anthony tells Kate to buy a _______. 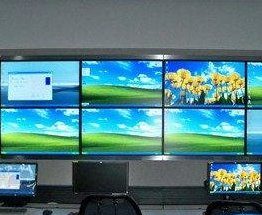 C A TV or a monitor? D Kate and her friends.